Today I am welcoming Leigh Dreyer, and author who reflects what Jane Austen Fan Fiction is all about! Leigh started out as a reader, but her love for Austen’s characters, and the need for more time with them, turned her into an author who is now delighting us with wonderful new stories. 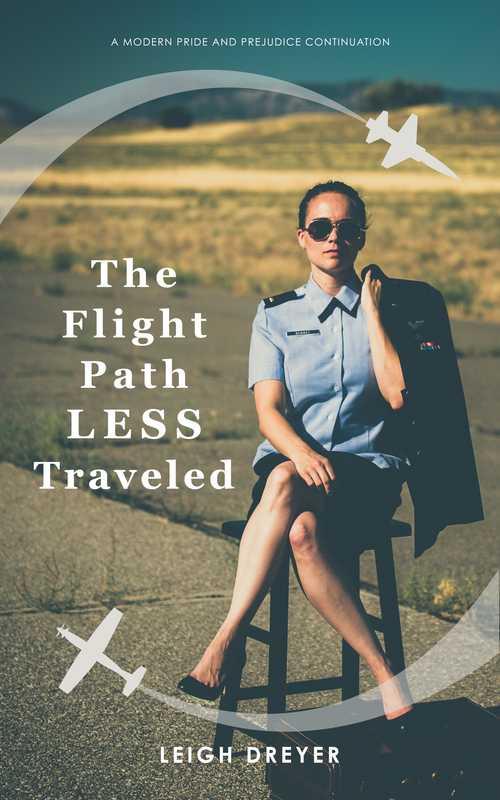 She has just released her second book, The Flight Path Less Traveled which is a sequel to The Best Laid Flight Plans, and today not only will she talk talk to us about the writing process for her, but also about this new release. Welcome Leigh, first of all, can you tell us when you first realize you wanted to be a writer? Interestingly, I never really did. I do other art: musicals, singing, etc., but I hadn’t really thought much of writing until after I had kids and found I was going a little crazy staying home with people who don’t talk. I found that writing was a great way for me to tap into my creative energies and still take care of my little ones. Writing has also allowed me to grow a lot closer to my sisters-in-law, one of whom is a writer and one who is an editor. About a month and a half for the first draft. When I’m really writing, I do about 1600 words a day and both of my novels are right around 75-80,000 words. Well, I have three jobs. I am a speech pathologist at a school in California and I work using teletherapy (therapy over video conferencing software), at a school here in Las Vegas, and then at a Long Term Acute Care hospital in Vegas as well. My schedule is pretty crazy most days. Did I mention I have two kids and am currently in a musical? Crazy. So, I write whenever I can. Mostly when kids are napping or in bed. If I’m doing well, I can hit my day’s goal in about an hour. I have to eat. I constantly snack while writing. Currently I am eating a chicken flatbread melt. I try hard to eat something like grapes or blackberries that I can snack on and feel healthy at the same time. They think its great. My dad is one of my main technical advisers and its been fun bonding with him over flying stuff. He’s given me the last line of the series…we’ll see if I use it. I wanted to be an astronaut so bad it hurt. I wanted to be Sally Ride. Honestly, most of Elizabeth’s childhood dreams are really just mine through a different lens. This book is part of a series, tell us a little about it. What about your main character in this series. What does he/she do that is so special? You know I love covers, can you tell us about the cover/s and how it/they came about? Thank you so much for visiting today Leigh! I really enjoyed having this “conversation” with you. I hope my readers enjoy getting to know you it as much as I did! Leigh Dreyer would like o offer one ebook copy of The Flight Path Less Traveled to one of my readers. The giveaway is international and will end on the 27th of March. To enter it all you have to do is comment on this post. You know the drill, share your opinion with us and have fun! The winners will be announced here shortly after, so don’t forget to stop by to see if you were the lucky winner. While I haven’t yet read book one,I do own it and am very much looking forward to delving into its myriad charms! Book two sounds like Lizzy is faced with a number of challenges,and while we all know how deuerninwd she is when put under pressure,I hope she’ll Kean on Darcy for extra love and support. Best of luck with your new book,Leigh. Hope your pregnancy gues well and that you welcome a beautiful bundle of joy into your hearts and home in a mere six months’ time. Thank you! I hope you enjoy both of them! And thank you for the best wishes for my pregnancy. So far so good! Good luck in the giveaway! What an interesting concept! I’ve added both very books to my to be read list. I look forward to reading them! Thanks! I grew up in this world, so it seemed the most natural place to put ODC. Good luck in the giveaway! What fun! I’m following you during this blog tour. Hope you don’t report me for stalking you. I just want to thank you, your family and everyone that is serving at home and on foreign shores, on land and in the sky. Your service and sacrifice are so appreciated. Blessings to all. Thanks, Rita for hosting. Stalk away! That’s the whole point, right? And thank you for your thanks. I know my husband, dad, and father-in-law always get awkward around thanks for their service, but as the daughter and wife of a service member, I can tell you just how much they give of themselves. Thank you! Good luck in the giveaway! Congratulations Leah on your new release! I’m currently reading it so don’t enter me in the contest. Love the military backdrop for Darcy and Lizzy and Elizabeth’s ambition to become a pilot. Lots going on in this story and I know your readers will definitely enjoy book two! Hope you love it! Thanks so much for your support, it means the world to me. I have book one and enjoyed it very much. I definitely need to read two and three! You mentioned that you are outlining a time-travel story – will that be JAFF? That is my plan! I don’t know that I can leave the JAFF world yet, I have too many ideas rolling around my skull. (This is the problem with basically just reading JAFF the last several years.) I am still too scared to go full Regency yet, but I want to dip my toe into the water. Good luck in the giveaway! Loved book 1. Looking forward to book 2. And now I see you are working on book 3!!!! Woohoo ! I am! I was writing away on it just two days ago! I plan to write a little more tonight. My hope is I can get it out before my baby comes in September…then I can give birth twice! ha! Enjoyed the interview and happy to hear that there will be another book in this series and that there might a time travel story in the works as that is one of my favorite story elements. Thanks for the giveaway. I won the first in this series in a giveaway and enjoyed it. It would be fun to read the second. Good luck in the giveaway! Hope you get your chance! I enjoyed the first book and now need to reread it. I loved me having Elizabeth as a strong, female pilot. I thought Leigh captured the P&P characters perfectly. Thank you for the giveaway! Congratulations on the book launch for book 2! Congratulations on your second book. Currently the first book right now and I’m really enjoying it. Lots of good feminist messages. I have book one, but have not yet read it. It is on a long TBR list. It sounds like Elizabeth will have a few challenges to overcome. Looking forward to reading what they are. This book is on my wish list. Thank you for the give away. Congrats on your second book in the series! I’m looking forward to reading it once the series is completed. Great interview. You definitely have a busy schedule. I’m glad you find time to write as well. Great interview. I am happy to hear that there is a third book in the works. Please don’t enter me in the giveaway, I have already purchased. I also say Thank you for your service to your husband, father, and father-in-law. I enjoyed the interview. I’m in awe of you, Leigh. How do you find the time to juggle three jobs, manage your children, write and have time to participate in musicals? I recently took advantage of the special offer for The Best Laid Flight Plans (thank you!) but haven’t had a chance to read it yet. It’d be great to win a copy of this sequel. I’d love to have been able to learn to fly but it’s an expensive hobby and now, I think those days are probably behind me anyway. Thanks for sharing your writing process with us, Leigh. It’s always interesting finding out how writers go about their business.